When the humidity rises along with the temperature as it has for the past three days, sweat runs off my scalp and down my face like water slick-sliding down the sides of a melting icicle. This morning, stepping outside into the heavy humidity from the overnighted dark cool of my garage was like walking through the thin skin of fresh pudding. That was four hours ago. Even with leaf-flickering breeze, the day has chased me inside, where a floor fan whirrs the air enough to make it comfortable. In the living room, back issues of Harper’s, The Atlantic and The Sun stack on an end table. I’ve been dwindling the pile for a couple of weeks. Another week and I’ll be caught up. Yet, after being wintered indoors for months, a brain nag insists I put my magazine down, hit “save” and close this essay, and head back outside. “I suppose I could,” my brain tells me, but then I pause and remember working up a sweat this morning just doing some minor weeding. I stay where I am. Sitting here inside and looking outside is a metaphor for my world and the world of who knows how many countless others. It’s more than physical places. It’s also a matter of mental places. Some days we’re a part of the world. Other days we’re apart from it. Sometimes it’s as if we’re lying on our backs in the lawn and the weeds are swallowing us, as they would swallow everything if our planet weren’t peopled. Other times we stand on peaks and can see for miles and miles. 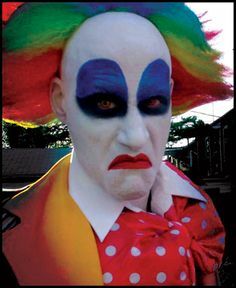 In our carnival of life, sometimes the clowns are jolly; other times they’re mean old men terminally greasepainted. The high-wire walker smiles and poses at the end of the rope with her triumphant arms in air; other times she climbs straight down the ladder and holes up in her trailer. The cotton candy can taste sweet, or it can turn us into a sticky mess. What’s the price of admission to the carnival? Once you’re inside the gate, you’ll know. "Some days we’re a part of the world. Other days we’re apart from it." Great line. I struggle with staying indoors, like you, when the dirt is calling for a playmate. But sometimes the outside temperature is just to prohibitive for what needs doing out there. We wait so long for this, I hate to complain so I try to suffer this July-in-May heat silently as best I can. If we waited for perfect days, nothing would get done. The same thing goes for gardening. Always fun to read what you write. Thanks, Jack! I hope summer is treating you well.